OK, so I succeeded in removing my diverter assembly in the tub and replacing all the washers/o-rings/bonnet packing/what have you, and cleaned it and reseated the seat and replaced it all with plumber’s grease where plumber’s grease should go and plumber’s goop where plumber’s goop should go. No dice. Still water out the tub spout while the shower is on. I’m looking more carefully into how it works, and I think I’ll have to measure distances inside the seat area to see why the part of the stem that is supposed to block off the water to the tub is not doing so when in the shower mode. Sigh. I’m hoping I can rig something – a bead of silicone or an extra o-ring? Might just have to bite the bullet and install a whole new faucet set. Here is a picture of my excellent sun exposure; courtesy of Andy Baker – at least this is good! Andy risked life and limb to get to the center of my slippery, icy, metal, south roof too! 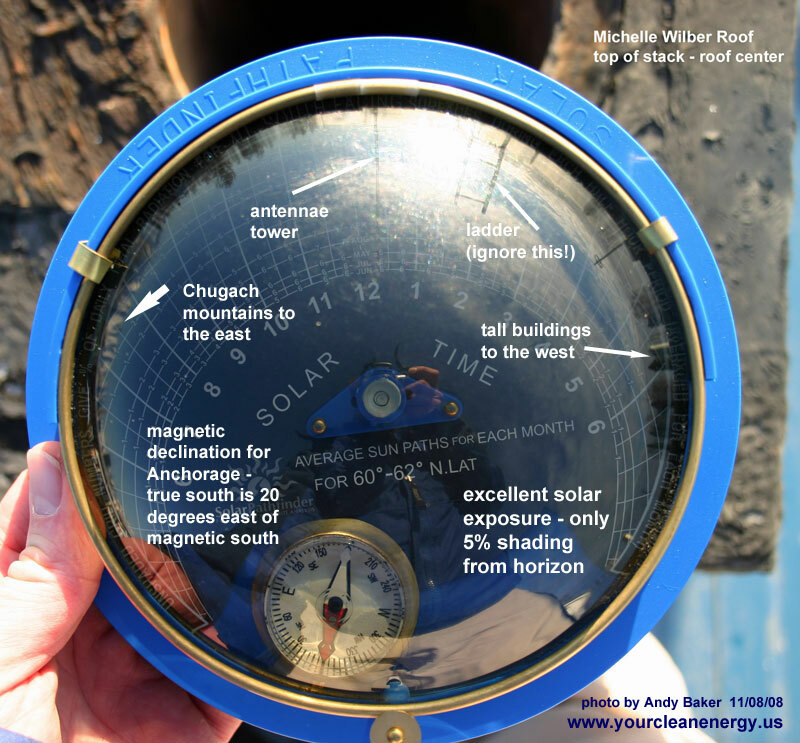 Click on the picture to see it bigger and read all the words on it – basically the horizon is projected onto the device’s face and areas blocked off can be compared with the sun’s path over time to figure out how much solar exposure the spot actually gets over the year. That’s a cool little tool. Can you swap in different backgrounds for different latitudes I wonder? I guessing ‘yes’ on this! I know Andy does work in other parts of the country too, so I’m guessing you don’t have to have one for each latitude range.